Située probablement sur le meilleur bloc de plage d'Avalon, cette maison de vacances ("Villa Lil Avalon") est la 3ème maison de la plage. Pas besoin de traverser des rues (idéal pour les enfants). Cette plage est l'une des plages les plus privés sur l'île. La maison elle-même a été méticuleusement entretenu. Les panoramas sur l'océan de la maison sont sensationnels. Avec une piscine mesurant 16x32, vous pourrez profiter de l'une des plus grandes piscines à Avalon. Beaucoup d'espace autour de la piscine pour se prélasser ou barbecue grillades. L'intérieur de la maison de votre famille trouvera de grands vastes chambres sur deux niveaux, deux chambres à coucher (une avec une vue magnifique sur l'océan), trois autres chambres, une bibliothèque, deux wetbars pour divertissant, et une salle de soleil carrelée hors de la piscine. Vous pourrez profiter de la terrasse exposée sud au deuxième étage donnant sur la piscine. Il ya un accès facile à une superbe terrasse au troisième étage qui vous fournira vue sur la plage, dans l'eau blanche et coucher du soleil les plus impressionnants. Tous les espaces communs ont des planchers de bois franc. L'aménagement paysager est luxuriante et mature. Situé à 60 & Dune Drive. Le propriétaire, Tom McLaughlin (609-736-4929), est la seule personne avec laquelle vous parlez pour louer la maison. Si vous voyez cette annonce nulle part ailleurs ou quelqu'un d'autre que Tom McLaughlin est représentatif de cette maison, il est une fraude. par exemple. Craigslist. Our stay at the house was absolutely wonderful! The house is very big and accommodating to multiple families. The upstairs is spacious and was a great place to relax and enjoy some great views from the deck! The "Crow's Nest" on the roof was spectacular. We watched 4 sunset's from up there while enjoying our cocktails. The pool was a perfect 85 degrees and we made it our routine to hang out there for several hours once we left the beach. There was plenty of seating around the pool with umbrellas. Even though we didn't use the grill, it was a great option to have available. The house is located in a quiet section of Avalon and really reminded us of being in OBX. There was ample refrigerator space to keep all of our beer cold. When renting we usually have to keep beer in coolers due to limited refrigerator space. We didn't have to use any of our 4 coolers we brought down. One small detail that we found to be beneficial is the amount of available beach chairs, umbrellas, beach toys, and bikes for use at the house. My recommendation would be to save space and leave your chairs, umbrellas, beach toys, and cooler (besides a small one for the beach) at home and use the ones provided. If you're also not stuck on having your own bicycle down there I would recommend saving the space and using the ones at the house. Tom was absolutely wonderful to work with. Due to his hospitality and our love of the house we will certainly rent from him again when we head back to Avalon! This house is beautiful and comfortable—was perfect for our all-ages family group. Owner was lovely to deal with, too. We especially enjoyed the pool and being so close to the beach! 60th Street is a perfect location, too—it’s quiet and residential but an easy bike ride to “downtown” Avalon or Stone Harbor. We’d rent again in a minute! We picked this home in Avalon as a central meeting point for the members of our family. Little did we know just how perfect it was. Upon arrival, the house was nice and clean and ready for us. We immediately put our suits on and jumped in the pool that was calling our names. Like bath water. It was so nice to have a pool right outside our door. We found this to be the best part of the whole vacation. Don't get me wrong, we spent plenty of time on the beach, which was only a few steps away, but it was always nice to have the pool waiting for us. We grilled out each day which was easy and ate at the three tables with umbrellas for most meals. It was a special birthday for my husband and myself and our children surprised us with a photo shoot on the beach. It was perfect. My elderly parents even came for the day and got in the picture which was quite special. They were actually meeting one of their four great grand children for the first time. Such a special memory now. As far as the house goes, with the two living rooms, all the bedrooms/bathrooms, very large kitchen table, the many refrigerators and all the deck space, it was a wonderful gathering place for our family. Everything was there....beach chairs, beach umbrella, beach wagon to haul everything, bikes, cooler, plenty of seating around the pool, we couldn't have enjoyed it more. The owner, Tom, was so accommodating. He answered any questions we had and made sure it was going to be a great time. It sure was. I highly recommend this lovely home. 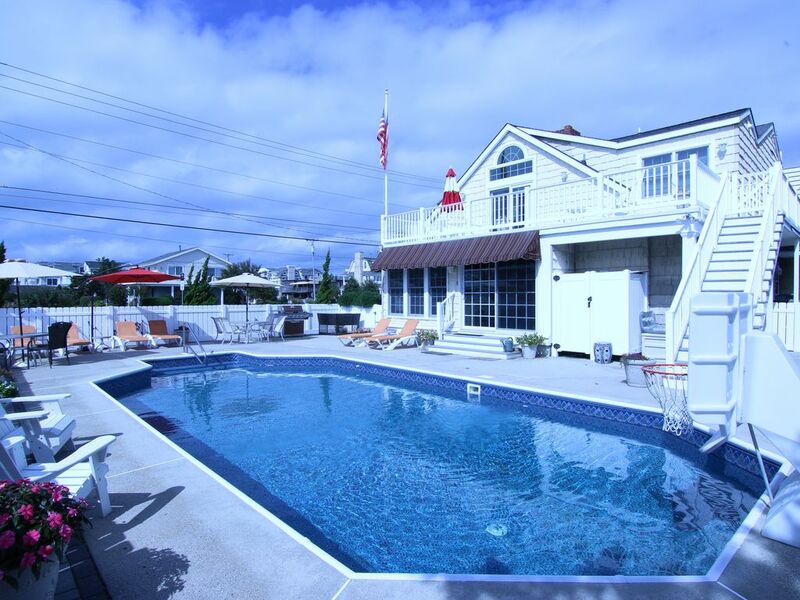 We rented this home for the month of June in order to explore Avalon and Stone Harbor. It was the perfect experience. We had family and friends join us throughout the month. We especially enjoyed the pool area where we could cool off after the beach, barbacue and hang out. The upstairs space which included two master bedrooms and living area and deck looking out over the pool provided us with the perfect balance of privacy and sociability as our guests arrived and departed during the month. I cannot say enough about Tom's hospitality. He went above and beyond to ensure we had a comfortable and stress-free stay. The location is absolutely perfect, situated between the two town centers and only steps from the beach. The House and the experience from looking to booking to actual vacation week was AWESOME! Each year we take our grown kids and their spouse/significant person on vacation. This year with the addition of a 5 month old grandson we wanted something close to home with lots of room, a comfortable place to stay, a home away from home. This was perfect! The house and what it came equipped with was more than we hoped for - nice beach chairs - Yeh! Real comfortable mattresses - Yeh! A wine refrigerator and 2nd in the garage - Yeh! Lots of room yet cozy places to all spend time together. Thank you Tom and family for sharing your wonderful home. We will be back! In the words of our 3 year old son, "This house is so warm and cozy!" The owner was so helpful as we planned our trip and that continued during our stay. The layout of the house is amazing and allowed for us and our guests to never feel like we were on top of each other. So many different areas to hangout! VERY Clean which was important for my family - we have a 3 year old and a 3 month old! Convenience of close proximity to the beach was so nice. Easy to head back to the house for bathroom, lunch or pool breaks. Pool and entertaining space outside was so relaxing. We enjoyed Cocktails and appetizers on the deck in the evening as we took in the sunset. Loved riding bikes into Stone Harbor and Avalon! This house truly has it all (although we couldn't find the most important tool - a wine opener:)) and we have already inquired about a second stay in September. This house will be part of our family tradition for years to come! Thanks Tom! Note: $750 refundable damage deposit is also due at time of booking. All bookings 7 nights or greater include end-of-stay cleaning included in quoted rates. If less than one week stay, there will be a $250 cleaning fee.